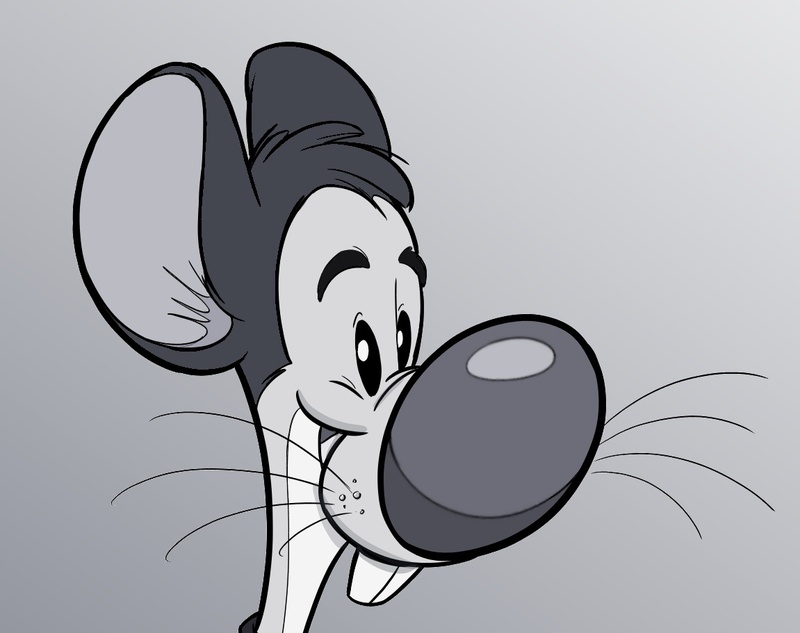 The Cartoon Cave: Beware The Furry Damon! I saw this by way of a link on Animated-News.com (A great site, by the way) and had to comment on it. In regards to my recent post on Anthropomorphic Animals, here is what I would caution my students to avoid at all costs! 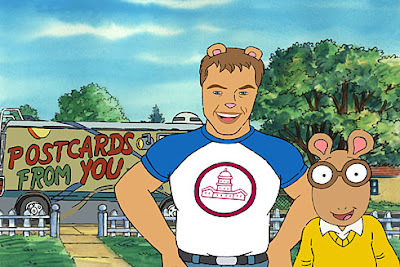 This is a pic from the show "Arthur", featuring a supposedly anthropomorphized Matt Damon as a guest star. I've always felt that the "Arthur" characters themselves were too much of the "animal head stuck on a human body" variety, but this monstrosity goes even further than that, simply sticking teddy bear ears and nose on a human character. It's more of an example of that oddball style of design called "Furry". Distinguished by having mostly human anatomy with a few animal characteristics stuck on, the "Furry" is more a mutant than anything else, and not something that qualifies as an Anthropomorphic Animal at all in my opinion. If this were handed in for the Anthropomorphism assignment by a student in my class, I would have to give it a failing grade for not meeting the criteria I set out on the handout sheet. Here's the news release on this hideous thing. 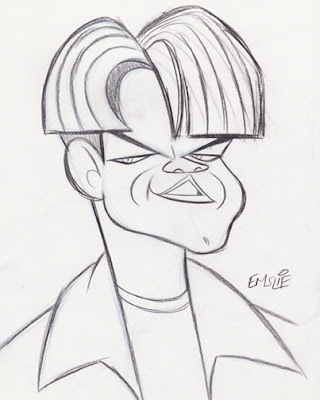 I knew I had sketched Matt Damon several years ago, so I went searching and finally found it. Here is my caricature of Matt back when he had a really funny haircut. He has such an interesting design to his face that I think it's a shame that the "Arthur" art staff aren't allowed to explore the likeness more, but instead have to settle for some visual pablum as per the dictates of the show's non-artistic producers. They probably should have just left him totally human in design, even if that doesn't quite figure into the world of "Arthur". Just a bad idea to begin with, in my view anyway. That is the funniest character design I've ever seen. What were they thinking? This is worse than the Will Smith and Angelina Jolie "Fish" in Shark Tale. Oh my... that is one of the ugliest, creepiest things I've ever seen. (although those fish in SharkTale are bad too) . Actually, you're quite mistaken. The idea of just putting animal ears and tails on an otherwise human character comes from Japanese Animation, not Furry. Actually, if you want to get technical about it, The Japanese probably got the idea from The Mickey Mouse Club. I would have to say that it was probably from the actor himself, or from his "people" who dictated what this character had to look like. I've had to caricature some actors for a couple of animated bits for broadcast awhile back and we had to get the final word on the design from all the actors themselves. Yeesh! It was nerve wracking, to say the least.